Apologies in advance to anyone still clinging to the fleeting days of summer. I know fall doesn’t officially start for another 2 weeks, but with the days getting colder, the nights getting longer, and the kids back in school, it’s time to accept the inevitable — pumpkin season is upon us. Brace yourselves. Do you love it? Do you hate it? Do you not really care either way? I have to admit that, up until I started reading food blogs a handful of years back, I didn’t even know the pumpkin craze was a thing. I thought pumpkins existed for the sole purpose of carving into jack-o-lanters — I had no idea people actually ate them. But in my defense, my family is Polish, and pumpkins aren’t exactly a thing back in the homeland. We never did pumpkin pie for Thanksgiving. Or pumpkin soup. Or pumpkin bread. Or… catch my drift? Pumpkin just wasn’t in the picture. Now, though? It’s rockin’ centre stage. I’ve been sitting on a handful of pumpkin recipes since the end of July (I know), so I’m kind of psyched to finally be able to share them with you. I try to hold off until at least September before subtly suggesting that you start introducing the orange squash into your diet, and with labour day in the bag, I think I’m in the clear. That’s not a bad compromise, right? I mean, yes — it’s pumpkin in what’s technically still summer — but it’s marginally detectable pumpkin in a soft and tender chocolate muffin that’s gluten-free, grain-free, dairy-free, oil-free, refined sugar-free, and 100% crazy delicious. So how ’bout them apples pumpkins?! Flourless muffins are actually some of my favourite things to bake (read: eat) because I’m a texture freak and the texture of these is spot.ON. 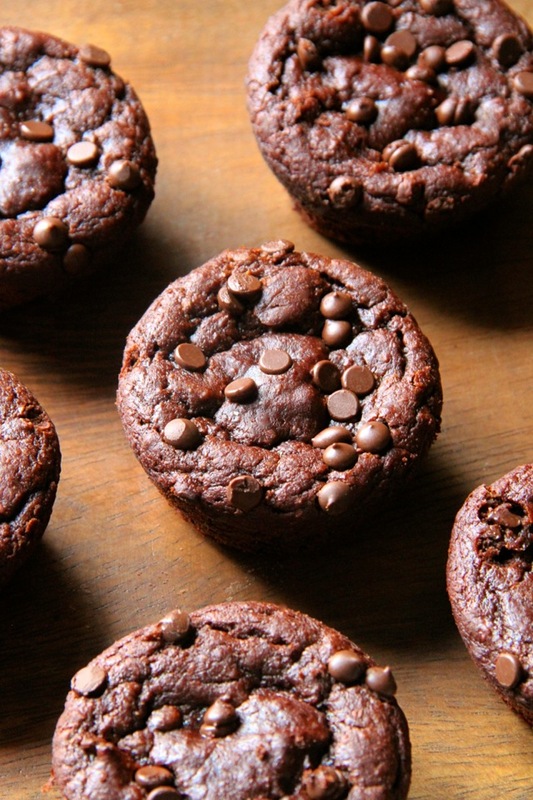 They’re a little denser and fudgier than regular muffins, but still soft and doughy in that melt-in-your-mouth kind of way. And the best part is that you can toss all the ingredients into your blender and whip them up in under 5 minutes. No fuss, no muss. 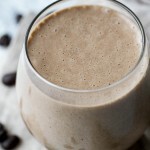 Add all the ingredients except for the chocolate chips to a high-speed blender or food processor and process on high until the batter becomes smooth and creamy. Stir in the chocolate chips by hand. Pour the batter into prepared muffin pan, filling each cavity until it is about 3/4 full and sprinkle with additional chocolate chips if desired. Bake for 15-18 minutes, until the tops of your muffins are set and a toothpick inserted into the centre comes out clean. Allow the muffins to cool in pan for ~10 minutes before removing. Store them in an air-tight container for up to 5 days, or freeze them for up to 3 months. * Feel free to sub in with another nut/seed butter. I like AB because it has a mild flavour that doesn't overpower the other flavours in these muffins. Pumpkin – love it or hate it? « . currently – september 2015 .
im usually over everything pumpkin this time of year but with the temps in the 90s still, it’s the last thing on my mind. But these muffins? I easily can go gaga over! It’s hard to imagine those temps! It was cold and rainy here all weekend — we were hovering around the mid-40’s! I broke out the canned pumpkin a few weeks ago, I was ready to play with it again and also add it to my oatmeal. I am sort of ready for fall but not ready so much for the back to school routine of homework and getting my son up early! I’m excited for everything pumpkin. I don’t know why but once pumpkin season sets in, I can’t wait. I feel like it needs to cool off a bit though beforehand. It’s actually plenty cold here — we had a really chilly weekend with temps in the mid-40’s. I’m definitely ready for pumpkin, especially chocolate+pumpkin. My family ate pumpkin pie but that was about it–I definitely didn’t realize the craze until a few years ago! It’s very, very real. Is there any way to do it without nut butter? I am allergic to nuts and soy/sunflower seed butter look too similar to peanut butter so they scare me. 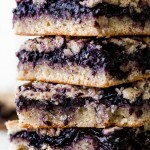 Unfortunately, the nut butter is a key ingredient in these since there’s no flour. But I completely understand your fear! I have a severe allergy to peanuts and trying soy nut butter for the first time was really nerve-wracking for me as well. It really is a killer combo! The flavours just compliment each other perfectly. Aaand I’m making these this weekend. Sorted. Woohoo! Hope you like them, Jen! Oh my. I had a pumpkin muffin in mind to bake today, but this one looks like it wins. Have to restock for the hubby. I don’t like winter but I do like all things pumpkin. I love how you used restock — that’s how I feel about my snack stash as well. Hope you and your hubby like them, Judy! Oooh yeah, I need these. I don’t have any almond butter at home, but I’m sure I can find something. It’s still crazy hot here, so I’m not feeling the fall vibes quite yet, but I’m so ready! A closet pumpkin eater! Love it 😀 I haven’t had to hide my habits, but I haven’t had much luck in swaying my family over to my side. Pft. They don’t know what they’re missing. I haven’t smelled that one before! I’ll have to keep an eye out for it the next time I go to B&BW. This is my favourite time of the year to buy candles. Haha! No I totally get it. It’s been super cold and rainy around here lately, which has helped it feel more tallish. And one of the downsides of blogging is constantly having to be ahead of the ballgame when it come to seasonal stuff so it has a chance to pick up speed by the time the season actually hits. Le sigh. Lalalal. Not listening to what you said about bananas 😛 But I enjoy baking with pumpkin too, so it’s okay. I’ve never tried it with pumpkin, but I’ve had butternut squash stuffed ravioli that was out.of.this.WORLD. 90% officially! Just a few minor details to work out first. 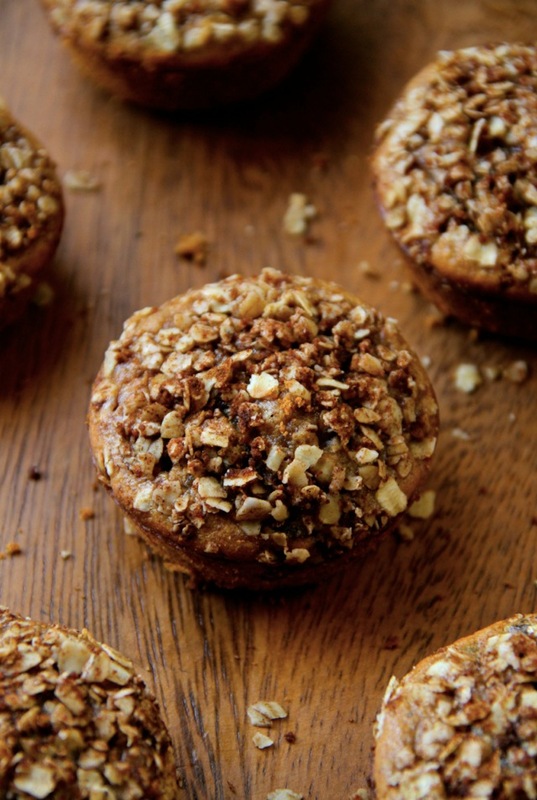 This might be your most magical muffin yet. The fact that they’re made without any grains at all is freakin’ unbelievable. WANT! 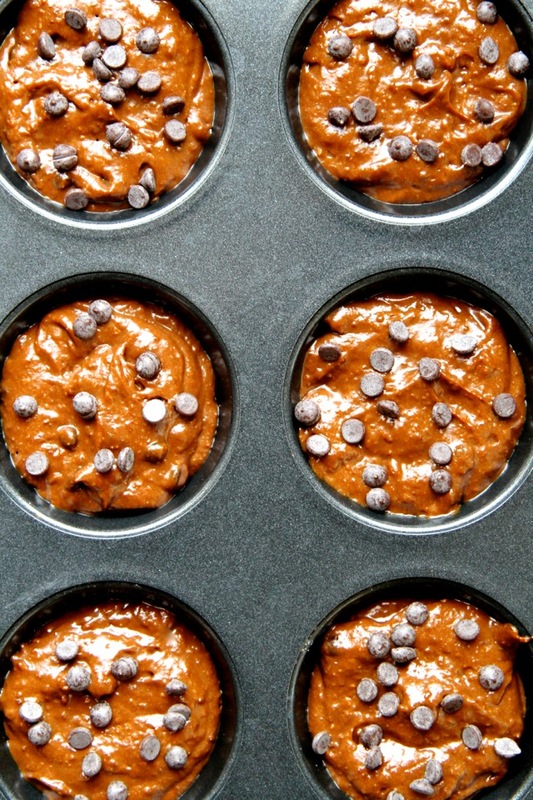 Your pumpkin muffins with chocolate chips are literally one of my all time fave muffin recipes. It is basically impossible for me to not eat all of them within 24 hours. So guess who is making these tonight!!!! Ok well it’ll actually be tomorrow night because I have an MRI to go to, but it will get done! I’d love to know how you liked them, Alex! All thing pumpkin, and chocolate. These are a sure win in my house, and the yare GF so Dave can have them too!! Will have to sub sunbutter but this sounds awesome! Pinning! Thanks, Sam! I hope you enjoy them! We only had pumpkin type stuff at Thanksgiving when I was a kid, and it was really just pumpkin pie and pumpkin bread. But now, give me pumpkin everything. Especially when you include chocolate! Love pumpkin, and the texture of flourless muffins, but it is so hot and I have a few weeks til my job starts, I am clinging to summer!! 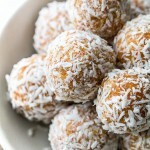 These look really good Amanda – I might try it out with tahini as I have a big bucket of it here! I do like pumpkin but like yourself, in the UK a it’s seen as a savoury thing that most use just to carve at Halloween (in fact people are kinda grossed out by the ideal of pumpkin spice lattes!). I tend to use it in baking but I do eat squash quite a lot which is so similar. Love all your recipes! Thanks so much for sharing them. 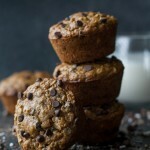 I just made your chocolate chip oat banana muffins and they’re delicious even without the chocolate chips :). 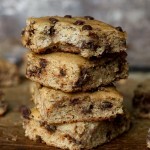 I’ve been noticing recipes like this one that say no refined sugar but they have chocolate chips as an ingredient. Is there a brand you use without sugar? I’m pretty new to clean eating and trying to eat no refined sugar. 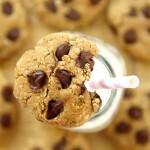 I’ve only used traditional brands of chocolate chips and I would think they are made with refined sugar. I recently purchased Enjoy Life chocolate chips which have cane sugar. Just curious what you use or suggest as far as refined sugar goes. Thanks! 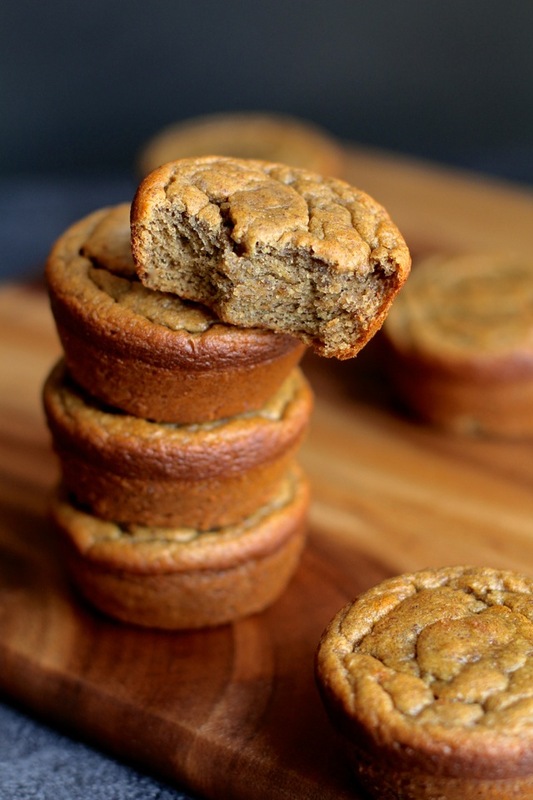 I can’t wait to try these pumpkin muffins and I love using the blender for these recipes! I have a harder time finding brands that sell sugar free chocolate chips, but I’ve had luck finding stevia sweetened ones in the bulk section of my local health food specialty stores. 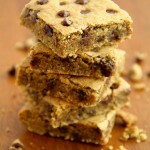 You can always cut up a bar of dark chocolate and have chocolate chunks instead of chocolate chips. That awkward moment when you’ve been pinning something you hadn;t even seen yet lol! 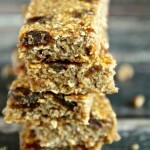 These sound amazing, Amanda; can’t wait to try them out and thanks for sharing this recipe! Pinning! Hi Cindy! Mixing them by hand would probably work just fine. If you have problems with the nut butter not wanting to mix with the rest of the ingredients, heat it up in the microwave until it gets a little melty and easier to work with. I’ve never tried it so I can’t honestly say for sure, but I don’t see why it wouldn’t work. I’d love to know if you try it! 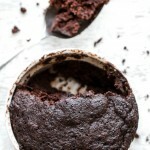 Did you use muffin tins or cupcake tins? I just made this recipe and was only able to fill 6 muffin cavities half-way, let alone 9 three-quarters of the way full. Did you forget to add almond flour? Or maybe it should have oats or something to make it thicker like your banana muffins? Nope! 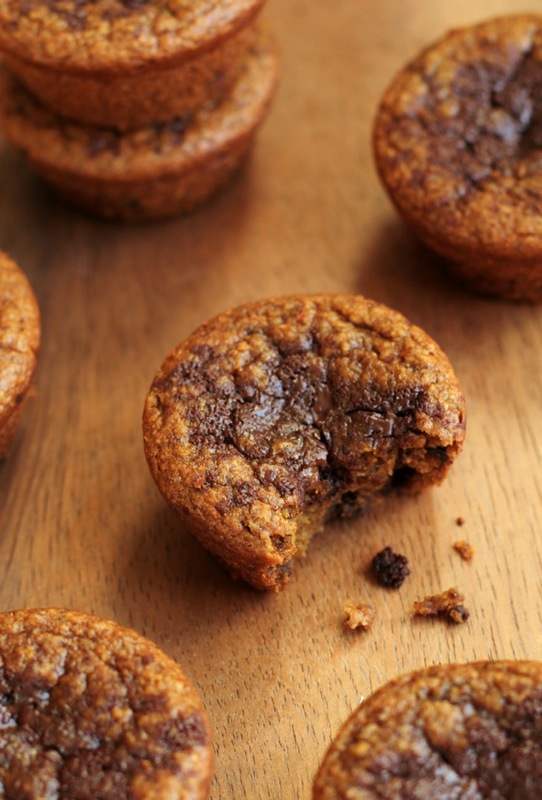 It’s actually the cocoa powder that takes the place of oats/flour in these muffins. I could barely wait for these to cool before going in for a taste. So good! A little bit brownie- like. I used 3 Tbsp of maple syrup in place of the honey and just barely sprinkled tops with chocolate chips and they were sweet enough for me (I’m coming off the Whole 30). Delish. Thanks for the recipe. Chocolate and cherries are a perfect pairing! I’m so glad that you tried them and liked them, Adele 🙂 Thanks for taking the time to leave a review! Hi there! Any suggestions as to what a diabetic could use to swap out for the honey? Thanks much. My mom is diabetic, any suggestions as to what I could use to substitute in place of the honey? It is a no no for her. Thanks! Agave nectar is a lower GI sweetener that can be used to replace the honey, or you can also buy stevia in liquid form which is considered safe for people with diabetes. The texture might be -slightly- different, Heather, but it won’t make a huge difference so go ahead and skip them if you don’t have any on hand. I just made these after seeing the recipe on another blog’s roundup. They are by far the best “pumpkin” thing I have made. I used only a 1/4 cup of honey and they are plenty sweet!! They won’t last long…thanks for sharing! I’m so glad you liked them, Lauren! Thanks for stopping by and taking the time to let me know. Wonderful recipe! Was curious how the consistency would turn out and they are fabulous! We ended up making a double batch of mini muffins (I have teenagers) and so glad we did. My daughter didn’t read the directions and added the chocolate chips BEFORE pulsing in food processor, and they still turned out wonderful! I have already shared this with my GF family member who bakes. Can’t wait to try the Banana and Apple variations. So I’ve made these 2X now doubling the recipe. 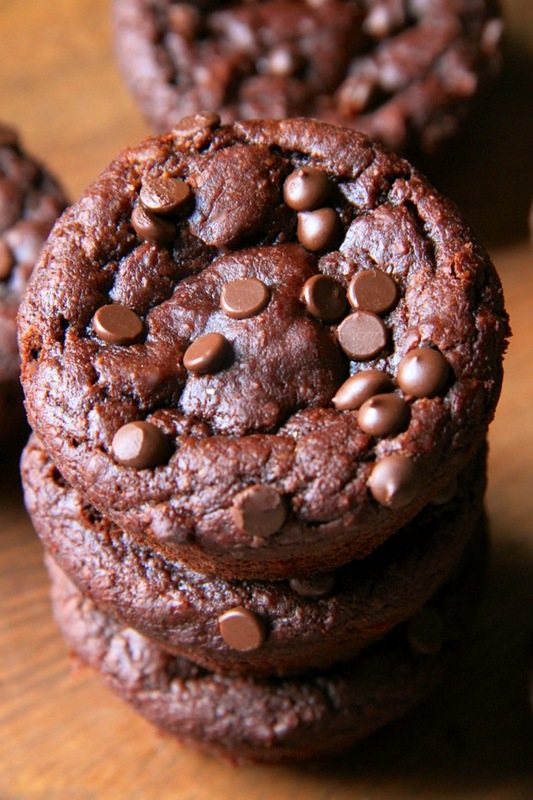 Modified by using Hersey’s Sp dark cocoa and using Sunflower butter since we have sensitivity to almond butters. Made mini bunts as well as muffins and brownie bites–all a success! Next, I will be making a 2 layered chocolate cake with the batter but haven’t decided on a frosting. Thank you for this awesome recipe! Made these on Saturday and can’t stop eating them! My sons also loved them. Pumpkin, chocolate gooey goodness! I subbed organic maple syrup for the honey just because I had more of that on-hand. Will be making this again! 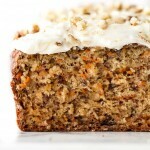 the taste of banana in recipes so I had been searching for a healthy recipe without it. Yay!! Thank you :). I will be making alot more of your recipes. The flavor in these muffins is fantastic! I love recipes that include weighted measurements since it makes it easier to use fewer cups & utensils. I used only one bowl and a few spoons. I’ve had bad luck with blender muffin batter, so I used my stand mixer. The only issue I had was that they weren’t completely baked after 18 minutes. They’re still a bit gooey in the middle. I didn’t have mini chocolate chips and used full size ones, so that could be the culprit. Either way, I’ll definitely be making more of these (probably tomorrow to use up the rest of the can of pumpkin) and freeze them for quick breakfasts or snacks. Can’t wait to explore the rest of the recipes on your blog. Thanks! I’m so glad you enjoyed them, Sarah! And I totally know what you mean about using a scale to measure instead of cups and spoons – there’s so much less to clean that way. These are so amazing! I made them for other teachers at my school and now several asked for the recipe. I used agave for the honey, cacao for cocoa, and flax gel instead of an egg. 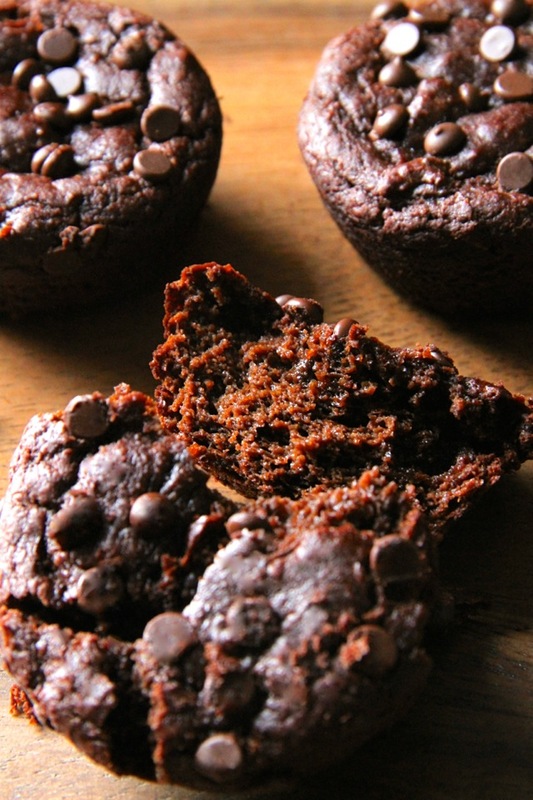 Hi, loved these flourless chocolate pumpkin muffins. Do you happen to have the nutrition details for them? Thank you for sharing these! These are wonderful! 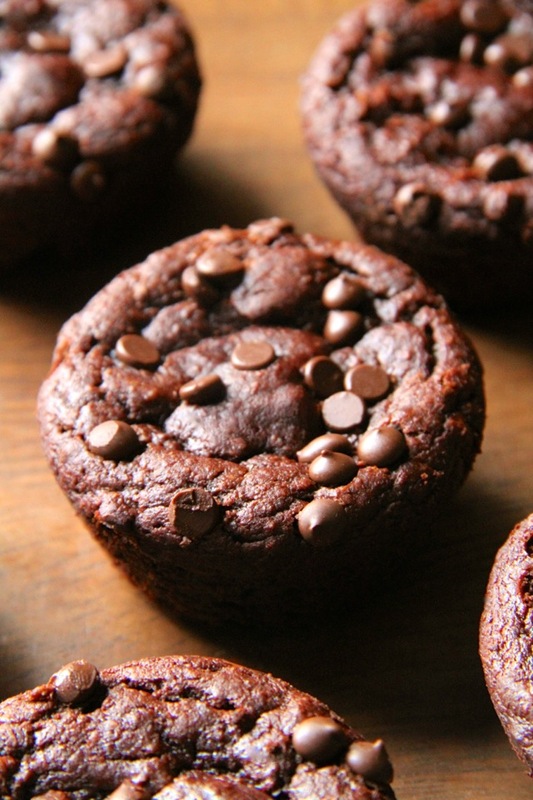 Love finding flourless, healthy muffins that are actually worth eating!! Will be making these very often and will probably double the recipe! I made these today! Absolutely delicious!!! I wish I could post photos! Thank you for all your free recipes!! I made these and they were delicious! If I were to make them as mini muffins, how long would I bake them? Delicious. 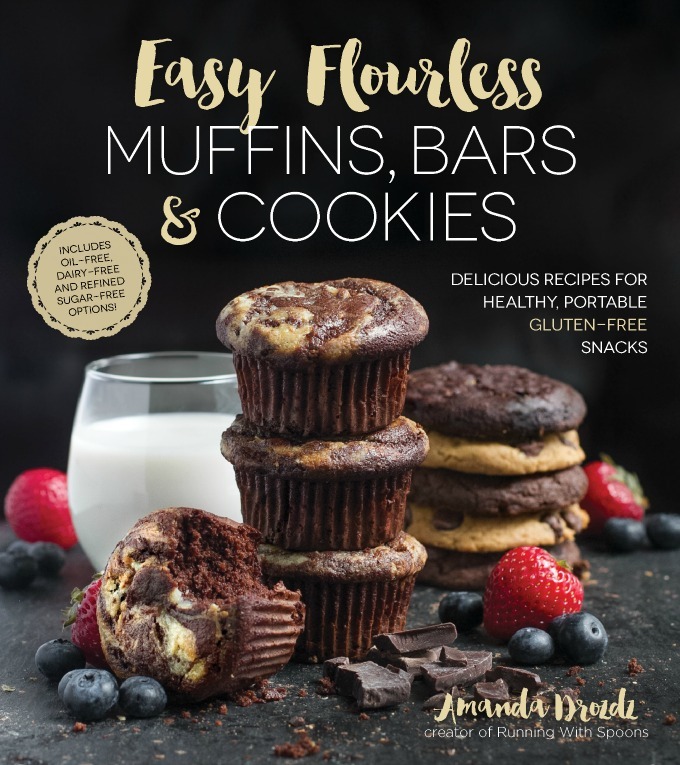 These are so good- I’ve made them as muffins and as a cake (double the recipe and bake in a 9×13)- they are great both ways! Thank you! OMG these are to die for! Yum! I used Justin’s vanilla almond butter because I had some left, so only put 1 T of honey. I also made them mini and baked for like 10 min. Deeeeelish! Very good! For anyone who wonders about substituting chia seeds for the flax seeds, it works nicely. 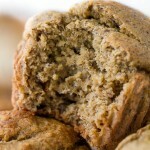 I have been making your Banana Oat Greek Yogurt muffins for months now, my family loves them! 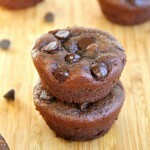 BUT these Flourless Chocolate Pumpkin muffins are soooooo delicious it is now my go to muffin recipe. THANK YOU!